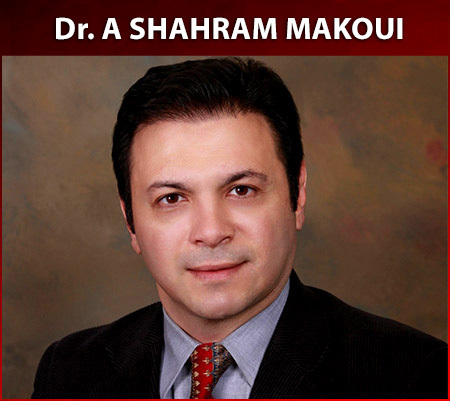 A. Shahram Makoui, MD, FAANS, is a Board Certified Neurological Surgeon. He obtained his "Doctor Of Medicine" degree with "Distinction" from the prestigious George Washington University, School Of Medicine And Health Sciences in 1995. Then he completed successfully his residency in Neurological Surgery at the University Of South Florida in Tampa, Florida, in 2001. Dr Makoui then founded the Institute of Neurological Surgery, PMC in September of 2001. He subsequently became Board Certified by The American Board Of Neurological Surgery (ABNS) in 2004, and then attained the status of Fellow Of The American Association Of Neurological S urgeons (FAANS) in 2014. He has been a member of The Congress of Neurological Surgeons(CNS) and The American Association Of Neurological Surgeons (AANS) since 1996, and California Association Of Neurological Surgeons (CANS) since 2001. He has had many publications and presentations, as well as multiple awards in the field of Neurosurgery and Medicine.